Earlier this year San Francisco kicked off a major benchmarking study against 16 peer cities. The data in the report is completely unbiased in relation to San Jose--our city had no part in the funding or creation of the report. 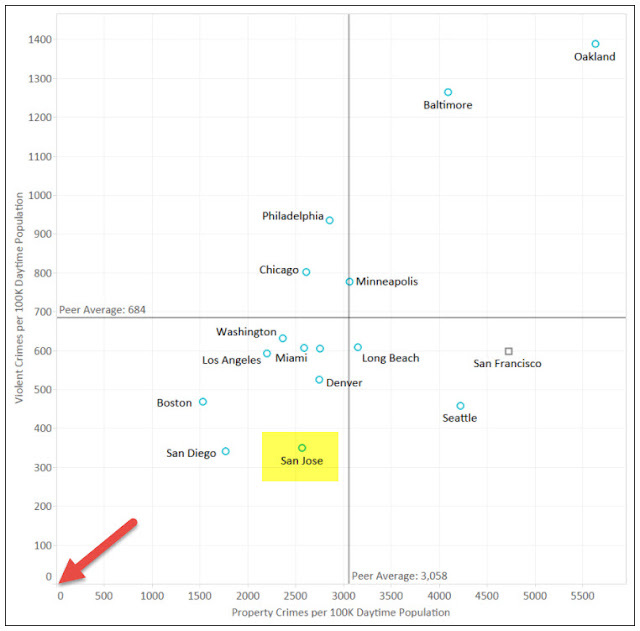 A striking chart that I came across shows both violent and property crimes in the benchmark cities. The ideal quadrant to be in for this chart is the lower left, meaning cities that have both low violent crime and property crime. The red arrow shows where 0 crime would be. Despite all of the noise regarding increases in San Jose crime over the past few years, not only were we in the best quadrant but we had the lowest per capita violent crime of any city except for San Diego. As for property crimes, we also beat out all but four cities (in a good way). San Francisco has nearly double the violent crime and property crime in San Jose proper. Oakland takes it to the next level with quadruple the violent crime. So if anyone ever tells you that San Jose is not safe, you can send them the chart below.